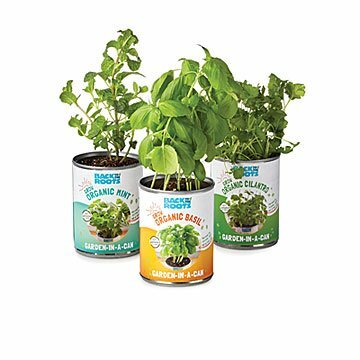 Grow your own greenery with this all-in-one herb kit. Perfect for the urban farmers or green thumbs who are short on space, this all-in-one set contains everything you need to grow your own organic herbs right at home. Looking for a fast and fool-proof medium for growing herbs, designers Nikhil Arora and Alejandro Velez teamed up with scientists from UC Berkeley. Through their research, they discovered biochar, a composite of the charred remnants of organic agricultural waste that was first utilized by Amazonian tribes centuries ago. The ancient medium has the ability to retain moisture to prevent over-watering issues, it also aerates the soil for quick root growth and fosters microbial activity in the soil, maximizing nutrient absorption. To use, simply pop open the recycled can, add water, and place it in a sunny spot. Within a few weeks your homegrown herbs will be ready to harvest and enjoy in your favorite dishes. Check out our Gift Lab to see a member of our team grow and taste test the Garden-In-A-Can! You just open the can, add water & voila! They were gifts for friends. Perfect addition to a tomato garden! Our volunteers are all conservation-minded, and these gifts reflected both the interests of our volunteers as well as providing a creative way to garden regardless of housing/yard space! I bought this as a Christmas gift for my daughter. She folllowed the directions but only two of the four plants have sprouted, the basil and sage did not sprout at all. The basil seeds were expired but she planted them anyway. Love the idea of this gift and the cans are so cute, but she is disappointed with the results. Was excited to get it and disappointed when I opened the cans up. I bought this for my wife for Christmas. Upon opening this morning, 3 of the 4 sets of seeds had expired a year ago. The one theoretically "good" set had clearly already been exposed to moisture and were moldy and ruined. Essentially, I gifted her 4 cans of dirt. If this is what's being delivered when folks buy this one, I'd suggest removing it from the site immediately. Love the old fashioned look! Using the product for fresh herbs for different dishes. I go this for my mom who loves to garden. She lives up north, so gardening isn't really possible during the winter months, so I thought this would be a great way to bring her gardening indoors for the colder weather. She was so excited about this gift-- especially the basil, which unfortunately never sprouted. The other three did though, and seem to be healthy.